future expansion and very economically priced due to the use of multiply-sourced parts. Next month we'll try to highlight some of the hardware-oriented goals of Beta test, as well as report on Alpha progress. Meanwhile, if you happen to be in Southern California during the weekend of June 4-6, be sure and come to the ARRL Southwestern Division Convention and San Diego Computer Fair -TAPR will be there in force, with operating TNC'S. 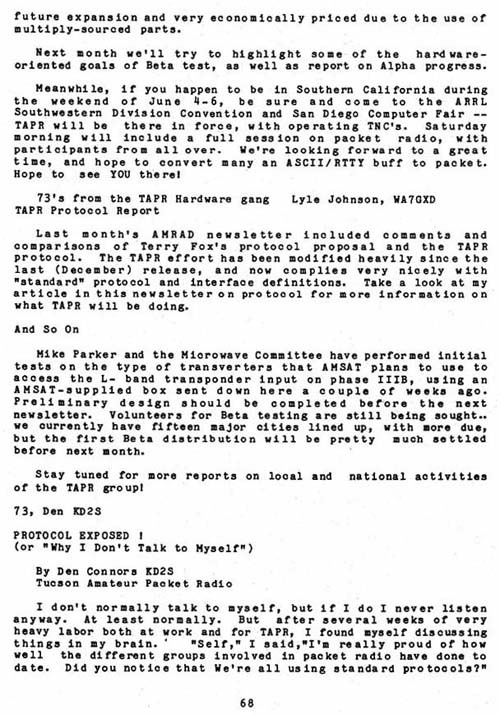 Saturday morning will include a full session on packet radio, with participants from all over. We're looking forward to a great time, and hope to convert many an ASCII/RTTY buff to packet. Hope to see YOU there! Last month's AMRAD newsletter included comments and comparisons of Terry Fox's protocol proposal and the TAPR protocol. The TAPR effort has been modified heavily since the last (December) release, and now complies very nicely with "standard" protocol and interface definitions. Take a look at my article in this newsletter on protocol for more information on what TAPR will be doing. Mike Parker and the Microwave Committee have performed initial tests on the type of transverters that AMSAT plans to use to access the L- band transponder input on phase IIIB, using an AMSAT-supplied box sent down here a couple of weeks ago. Preliminary design should be completed before the next newsletter. Volunteers for Beta testing are still being sought.. we currently have fifteen major cities lined up, with more due, but the first Beta distribution will be pretty much settled before next month. Stay tuned for more reports on local and national activities of the TAPR group! I don't normally talk to myself, but if I do I never listen anyway. At least normally. But after several weeks of very heavy labor both at work and for TAPR, I found myself discussing things in my brain. "Self," I said,"I'm really proud of how well the different groups involved in packet radio have done to date. Did you notice that We're all using standard protocols?"